DMOZ - Dude Whats Your Deal? Dmoz, where art thou? Thou hast forsaken your loyal users and contributors and become a tyrannical organization. Dmoz.org founder Rich Skrenta opines on the ongoing internal struggle of the open directory, and how many problems could be related to retaliation by Time Warner employees over the failed merer with AOL.com. Skrenta admits that dmoz is broken and has succombed to SEO’s. He seems to relish the fact that the site had a PageRank of 10 and forced Google to re-engineer their algorithms to accomodate the dmoz spam. Everyone knew a listing in the open directory was worth gold, and now it literally seems to require gold (or cash) to be added. I have been a contributing member of the open directory since 1999 and during my time as an edit of several small categories I took great pride in makine sure only quality sites were listed. Approximately 1 in 5 submitted sites were good enough to be listed, and the rest were low quality spam. 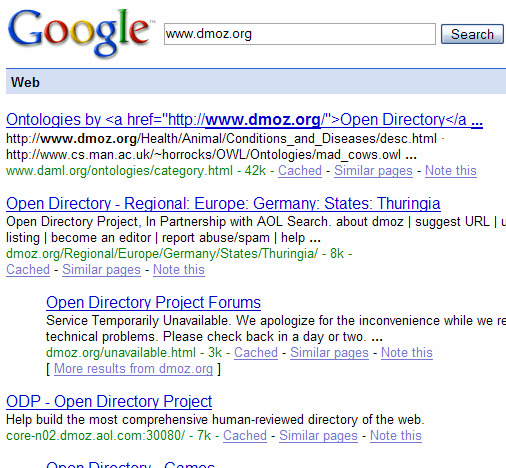 Google search engine results page for the dmoz search. Note dmoz.org is not #1. Many websites and blogs are discussing the current state and future possibilities of Dmoz, but the biggest question is how many people really care? I mean seriously, who uses the open directory as an information resource? Filed under linkbuilding, since no one outside the search engine optimization community seems to know what Dmoz.org is.